Spring has sprung early here in the City of Angels. As I sit in the studio typing this post the birds outside are singing a sweet song. Last week while watering the sages, and other natives in the garden I noticed some quite a lot of flowers starting up. Both my Lavandula angustafolia and Salvia cleveandii have flowers. How very appropriate as the new edition of Vera debuts in these next few days. On Sunday Greg and I spent the day weeding in the garden. It was fantastic to get my hands in the dirt once more and inhale the artemesia and sages. How I adore the aromas of the chaparral! In the garden the top performers have been Artemesia californica, Salvia cleveandii and Salvia apiana. 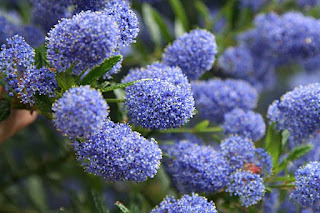 Regrettably the Ceonothus, California lilac, have not done well at all. I've tried several varieties and still they have been a challenge. This is particularly distressing as it is the main plant that was chosen when I took the California native plant landscape design class over at Theodore Payne Foundation. Carol Bornstein warned us that normally two out of three natives that you plant will die. In the case of the Ceonothus it has been much more. No bother, I'll just focus on the Sages and see if the Ceonothus prefer pots or a different location on the hillside. Many of the neighbors in the area have Ceonothus in their gardens, so I know it will do well in the area. it may just be a water or soil challenge. The native roses down at the bottom of the slope seem to be doing well, although they look a bit straggly. I'm contemplating putting them in pots and planting something different in their place, like the artemesia and sages. I heard someone in my bee group mention that the honey bees really like the cleveandii, thus I may be focusing on that one as well. Hmmm, native sage honey, what a treat!